Renee Lesselroth Roberts’ career has been a wild ride. She’s worked as a scenic artist on movie sets, built a business faux painting walls, cabinets and furniture, and created her own original art using a variety of mediums. But that’s just the beginning for this Atlanta-based artist. Her passion comes through as she talks about her work. I’ve always loved painting realistic scenes, animals, and people’s faces. As I get older I’m finding that I like to paint abstract designs. I enjoy multi-texture mediums that involve mica, acrylics, paper mache, glazes, gold- leafing and lots of metallics. What types of faux painting have you done? For 18 years I’ve specialized in faux finishes. I’ve faux painted cabinets and furniture to look antique and I’ve even painted a pool deck to look like cobblestone. I’ve also painted walls to have a distressed, old world, Tuscan look. How was your work on the television set of “The Vampire Diaries”? It was a lot of fun. I created caves out of styrofoam, mud, and moss. We used hot glue and glue guns to create spider webs. I spent a lot of time painting tombstones. It got a little stressful when the director would call me over in the middle of a scene when something didn’t look right on camera and I had to fix it. I had to have a bag of tricks up my sleeve to fix any problem quickly since all the actors would be standing around waiting and watching. What about “The Hunger Games” movie set? paint techniques to make them look either distressed, or to resemble wood, stone, or marble. Sometimes it took layers and layers of paint to get the look I wanted. 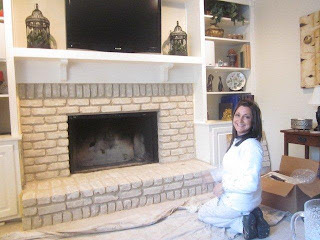 You tried the Brick-Anew Paint Kit on a brick fireplace for one of your clients. What do you think about the results? The results were amazing. My client wanted to get rid of the dark colored brick in her den but wanted to keep the real brick look. I didn’t have much time to spend on the project so I thought I’d try the Brick Anew Brick Fireplace Painting System. We chose the twilight taupe, a light taupe/tan combination, which would lighten up her room. The kit took out all the guesswork and trial and error. The paint colors were perfect for the project. There was no blending or trying to match colors. The paint had the perfect sheen - not too shiny and not too flat so it really looked like real brick. The paint was formulated to adhere to the brick so there would be no chipping or peeling. There was no odor and a short drying time. The clean up was a breeze. I’d definitely recommend this product to anyone. You don’t have to be an artist to use it, that’s for sure! paintings on canvas and some other multi-texture art that will be on display. I’m excited to finish the pieces I’m working on so I can put them in the show.